What's the best way to search for specific terms in files? I have a situation where the client will be uploading a ton of pdf files, and then on the front-end we need a tool to search for key-terms within these files. Sometimes that key-term is in the file name (could possibly break apart with php to get the terms?) and sometimes the key-term is just in the file itself. I've looked into Channel Files, and of course native EE search and File Entries, but none are really giving me what I need. Native search doesn't seem to be able to search native files, nor Channel Files? Plus, there are thousands of these files, so I don't really want to load them all into a template and then filter. Hoping for a less resource-heavy way of doing this. Someone may search for the term: FFOBULN2F000004 - that term needs to be able to pull up this file in the results, and also shouldn't be case sensitive. This is working almost perfectly. 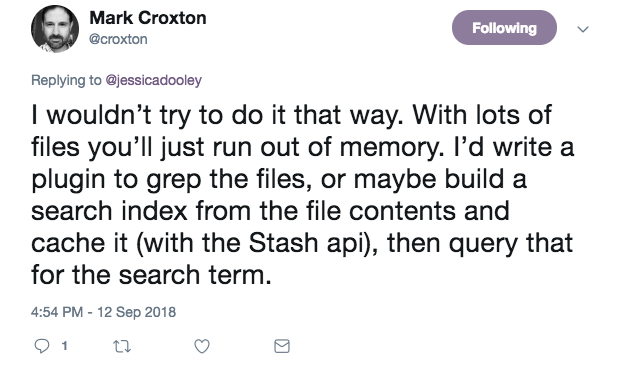 I got some feedback from the developer of Stash (Thanks again, Mark!) on this via Twitter, and he advised not to do it this way. So I went back to the drawing board. I ended up having our programmer help me out and write some custom php to perform a search in the file directory, and return the results in my template, rather than use any EE tags. Basically, the php converts all of the file names to lower-case. Then searches the filenames to match against the key-term entered. Removes the server path from the file so we have a clean URL and display file name. Then writes the results to the template. Not the answer you're looking for? Browse other questions tagged stash search php files channel-files or ask your own question. Is there a way to search just a specific channel field without searching the title field? File Category or Assets Folders for File Listings? What is the best way to tag images for use in other channels? How can i do filtration search of channel files extension with low search?